Love the raindrops on it. Beautiful, what an amazing color! such a lovely capture, beautiful flower and color! I am your new folower! Very nice. It makes me think of the tropics! Gumamela. I wonder why they don't call this flower that name too. Oh well, it's pretty and i love the pink color. So beautifully displayed. It's color is gorgeous. So pretty! Really lovely color. nice flower looks like umbrella..
Those dewdrops are well captured. pretty thing to wake up to, thanks for sharing! 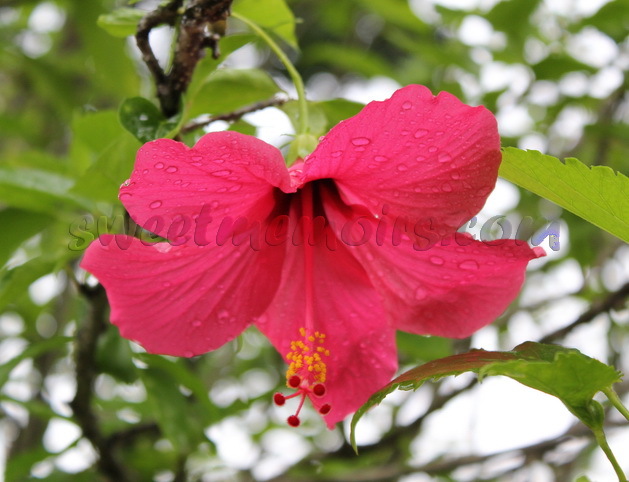 Aren't hibiscus great? I didn't used to appreciate them properly - now I love them. Nice flower i like it. Happy PS! Mine is up..
Linda, singela, uma bela flor ! I love this particular shade of pink, just so beautiful. Beautiful, one of my favorite flowers. Happy Mother's Day! What a pretty pink. Beautifully composed. what a great shot!!! Beautiful! Thank you so much for sharing your garden with my Friday Flaunt this week...I do hope you will link in again soon! What a special capture! Love the flower, love the raindrops, love it all! Stunning, lipstick pink! The raindrops add a gorgeous sense of freshness! beautiful pink hibiscus :-) super loved it :-) Dropping by from PF.